Many of my favorite lifestyle bloggers post about food, like Emily over at cupcakes and cashmere, who is kind of a rockstar in the kitchen. She shares recipes and beautiful photos of her concoctions displayed in some of the cutest measuring cups and dishes I’ve ever seen. When I started my other blog, The Coastal Chicster, I was hoping to share things like fashion and beauty tips, decorating ideas, restaurant reviews, beachy travel stories, and of course, recipes — complete with my own photos. There are several reasons why I have two blogs, and this is just one of them — I am actually a clumsy mess in the kitchen, and I don’t feel bad about it. Every time I’ve shared a recipe on The Coastal Chicster, I’ve tried desperately to take photos of my food, but I’m usually spilling enough flour all over the place without having to worry about knocking over my wine glass trying to reach for the camera with my buttery fingers, so all I’ve got to show for my efforts is a folder full of pictures of lumpy-looking eclairs, poorly lit bowls of batter, and a pot full of stir-fried vegetables that vaguely resembles a sort of medieval stew. Yum, right? Then I would start to feel bad, like I had failed at cooking because I didn’t get any good photos for my blog. Whatever. That’s dumb. Don’t get me wrong. All of my food tastes amazing, but the kitchen is small, the lighting is bad, and my boyfriend’s square, navy blue bowls don’t do much to compliment the colors of what I cook. Neither do his orange measuring cups or the mismatched random bowls I used to mix things up, so I’ve pretty much given up on the food photography. 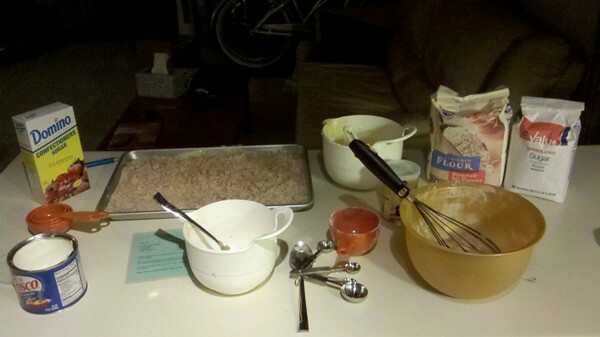 I made my grandmother’s crumb cake for dessert tonight, and I wasn’t even going to bother with the camera until I turned around and saw my picture-perfect mess on the counter. Picture-perfect for this blog. This is pretty representative of what happens every time I bake something. Every time. We’re talking flour in my hair, butter on the walls, sugar on the floor — you name it, I’ve spilled it. Despite that, I really do enjoy cooking and baking. J bought me a cute apron for my birthday this year, so that’s really helped (kind of). Sometimes I really screw up — like the day I used four sticks of butter instead of four tablespoons. Or the time I spent hours baking and decorating a chocolate peppermint cake and then dropped the cake carrier on my way out the door, which was the same day I successfully made whipped cream from scratch with a plastic fork at work, I’ll have you know (to cover up the messed up icing, of course). I guess you could say that I’m a pretty good cook, but I’m kind of awful at the act of cooking. I’d rather that than the other way around though — graceful in the kitchen making horrible food? Nah. Anyway, I think I have to go clean up now. It’s quite alright to be messy in the kitchen. Why else would all the great chefs of the world have an army of assistants? It’s to clean up after them. I’m always messy in the kitchen too. Your father has pointed it out on more than one occasion. He says I definitely need someone to clean up after me as I go along. I suggested he apply for the position. As far as dropping stuff, I am super clumsy in the kitchen. I can never make anything neatly. I stopped trying! All that matter is the finished product. If it looks pretty good and tastes even better, then it was worth the mess. I made a jack o’lantern cake…I’ll send a picture.